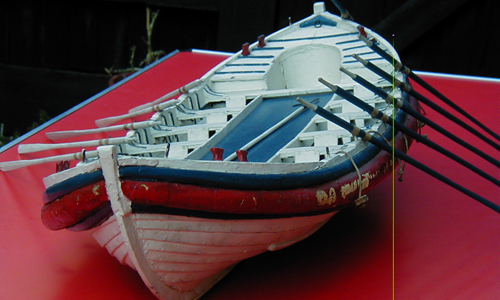 A model of the first lifeboat to be stationed at Cromer from 1805 until 1830. She was built by Henry Greathead, at South Shields, and was 25ft long and rowed 10 oars. Although no officail records are known to exist, she launched at least 5 times and saved at least 31 lives. In 1830 she was transferred to Wells. The story of Cromer from the earliest recorded times is one very much concerned with the sea. As A Dictionary of Cromer and Overstrand History illustrates the wills and tax returns of medieval times record a living from the sea and journeys to distance places on the ocean. The passing sea traveller sometimes did - and still does - come to grief on this section of coast, with the nearest harbours of refuge some distance away. At the end of the 18th century there was a national movement to provide lifeboats on various parts of the coast of the United Kingdom. The then Lord Suffield took a keen interest in these developments and led the way in starting such a service in Norfolk. Advice was obtained from Bawdsey in Suffolk where a Greathead lifeboat had already been put on station and a meeting was called at Tucker's Hotel in Cromer to set up a committee to run a lifeboat station. The first meeting was in 1804; in 1805 the Greathead lifeboat number 33 arrived and was kept on the beach. A model made for the Great Exhibition in 1851 enables us to see what the boat looked like; it can now be seen in Cromer at the Henry Blogg Lifeboat Museum. Two other lifeboats followed, before the first one to carry the local name of Benjamin Bond Cabbell. A second carried his name and then came the Louisa Heartwell, the lifeboat which would bring Henry Blogg to national fame. These were all rowing and sailing lifeboats; the 1920s saw the coming of pier head motor lifeboats, with a second boat continuing to operate from the beach. The photos on this page take you through as many of the boats as we have pictures for; captions are kindly supplied by local lifeboat historian Paul Russell. His own books tell more of the story and the station web site; details of all current activities of the Cromer inshore and offshore lifeboats, can be found at Cromer Lifeboat Station.